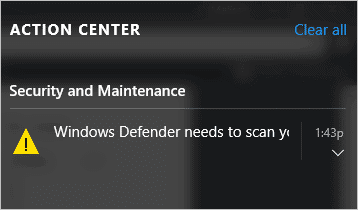 f you installed a third-party anti-virus program, Windows Defender is automatically turned off. It will turn back on when you uninstall anti-virus software. When you’re ready to use Windows Defender, search for it via Cortana. If you’ve never run it before, you’ll be prompted to run a scan. Run a scan. 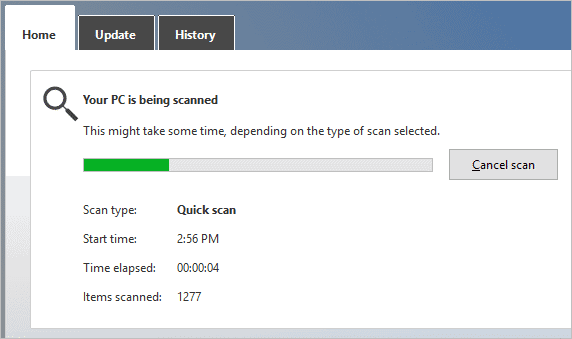 You can run quick, complete and custom scans, similar to other anti-virus software. By default, you’ll run a quick scan. When finished, you’ll be given the results and told how threats were dealt with or given the option to deal with them yourself. The settings in Windows 10 are simple. Click on “Settings” which will open Windows Defender in the Settings app. From here, you can toggle on real-time protection as necessary. You can also turn on cloud-based protection to get more accessible real-time updates from Microsoft as they find them from users. 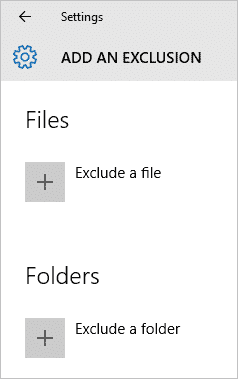 Below that, you’ll be able to exclude files and folders as you see fit. Click “Add an exclusion” to do so. 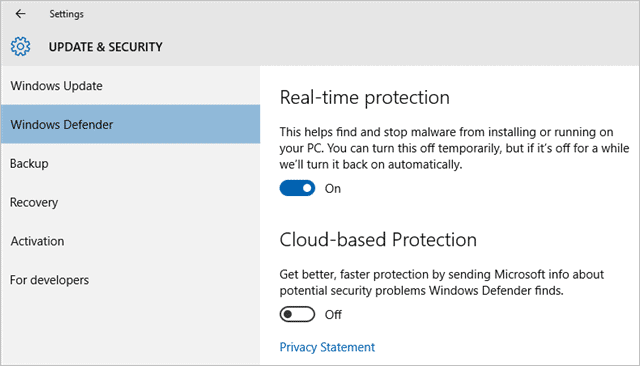 Windows Update will provide the latest definition updates for Windows Defender but you can still manually update if necessary from the program itself. 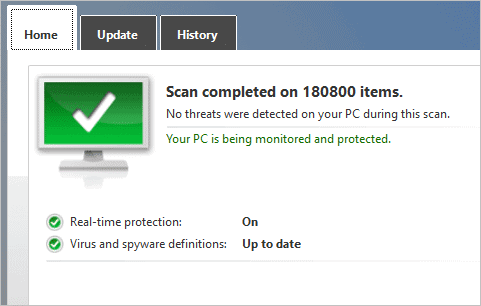 You’ll also be able to see the history of what Windows Defender found and how it dealt with it, too. 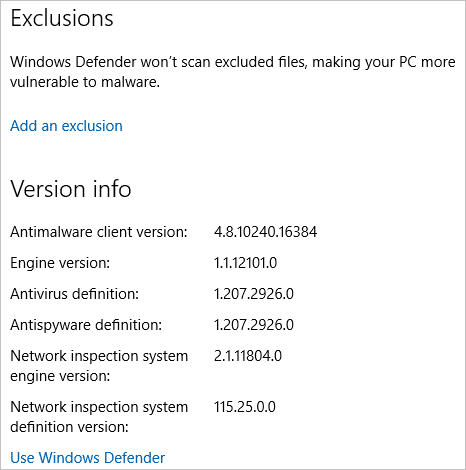 Like we said, if you install an anti-virus program, Windows Defender will automatically be disabled in Windows 10. However, if you want to disable it for any other reason, you’ll want to search for “Windows Defender” in the Settings app. Turn off the real-time protection slider. If you ever want to enable it, just turn the slider back on. While Microsoft wants you to use its built-in tools, like Windows Defender, Edge, and more, not everyone trusts Microsoft to make the best decisions for consumers. Whether you use Defender or not, you need to find the best possible antivirus solution for your PC needs. 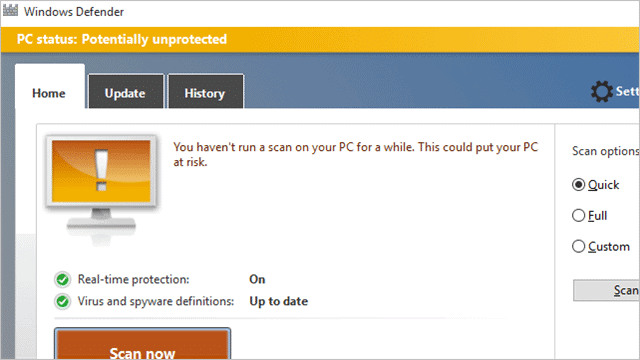 Windows Defender can help protect your PC but how much protection do you really want in Windows 10? Only you can decide. Just make sure you’re using some kind of protection whether it’s Windows Defender or a third party anti-virus program.